Two years after graduating from college with a liberal arts degree and losing 30 pounds, I decided to go back to school and become a Registered Dietitian. Here is my story! Upon graduating from Davidson College with a degree in history and [almost] an anthropology minor, I decided I wanted to work in public relations. The field was “cool” and entry level jobs seemed to require things I had: strength in writing and research, the ability to think creatively and multitask and a people personality. I tried my luck at applying to jobs, but the market was tough and I came in second for multiple interviews to those who had internship experience in PR. Luck did strike, though, because shortly after graduation I landed a job writing for a visitor + travel magazine. The job was great for entry level, but the workplace was not ideal, and a year later I was job searching again. I nailed an interview at a cool firm and became an Account Executive. The job was cool – I got to plan events, met chef Sara Moulton and planned the implosion of the old Charlotte coliseum. But all-the-while I yearned for a job that gave me a bit more flexibility. I hated that I was required to be at work from 8:30 to 5:30 even when there was little work to do (and on holidays when all of my clients and coworkers were gone) and I felt chained to a cubicle. When I’d venture out for doctors appointments or meetings, I’d slip into coffee shops and see people working on laptops or chatting away and always wondered what they did for a living. My only goal for my next job was to have the freedom to work on my own time, but I had no idea what I wanted to do. I liked public relations, I just didn’t like working in an office. I was also bored a lot of the time, and the other younger people in my office were in other departments, so I didn’t get to interact with them much. I think had I worked in a different office I might have loved public relations, but instead I found myself unfulfilled. During this time I was losing the weight I’d gained in college. The summer of my wedding, I had just reached my goal weight and was learning as much as I could about nutrition. I read nutrition books (Superfoods HealthStyle and Fit From Within were favorites) and yearned to share with others the knowledge I’d gained throughout my weight loss. Whenever nutrition counseling came up in conversation, people told me I had to be a Registered Dietitian or I wouldn’t get very far. At this point, I started researching. 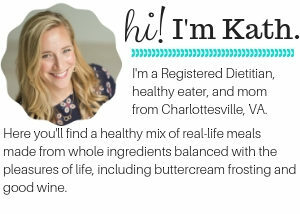 The nutrition field is so broad I realized dietitians worked in many industries beyond hospitals and long term care centers – I could have my own practice, write articles for famous magazines, have a Food Network show (long shot! ), work in a gym, and more. The options in the field were endless, and I could piecemeal a career together. My initial instinct was to research nutrition programs. But after some quick Googling, I realized there weren’t any in Charlotte. I pondered a degree in kinesiology and even had a few weeks when I decided I should go the personal training route. I even ordered the books for the ACSM exam! But after thumbing through them I realized that it was not muscles or movement I was really into, it was weight loss, food, cooking and healthy living. I knew there was a nutrition program at UNC-Chapel Hill, so I emailed the head of the department there to learn more about what it would take to become an RD. She was the one who actually told me about Winthrop, a university just over the North/South Carolina border about 30 minutes from my home that had a didactic program in dietetics and an internship too. I had not bothered to include South Carolina in my search for programs assuming I would have to move to go out of state, but it was closer than I realized. 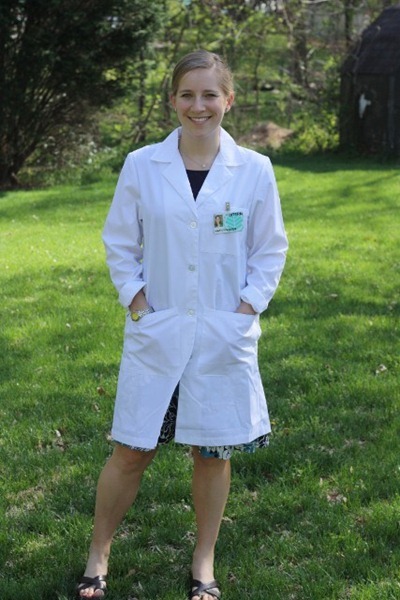 I was thrilled to learn I might be able to become an RD where I already lived. I immediately emailed Winthrop and set up an appointment with the director to see what it would take to become an RD. This was no “nutrition certificate” quick fix. This was a second degree. Winthrop required that I enroll as a graduate master-seeking student since I already had a bachelor’s, so I would be working towards a Masters in Nutrition and my RD at the same time. 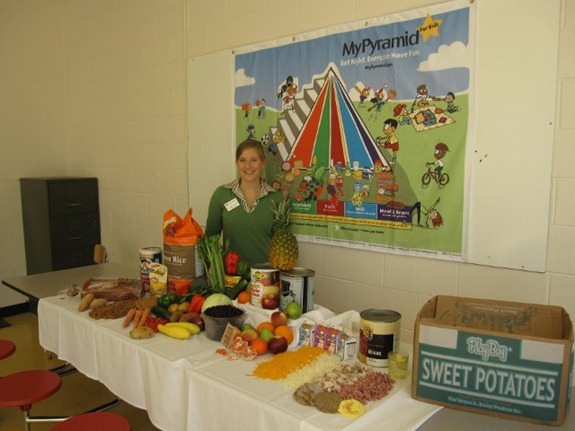 The way Winthrop’s program works, all of the nutrition courses are prerequisites of one another so you can’t do it any faster than 2 years – including two summers of summer school. But a big plus of the program was that I could take the sciences and nutrition courses at the same time rather than taking a bunch of science perquisites before I could get to the subject that I was really info: nutrition. That was a HUGE plus. I knew it would be an intense two years to fit all of the nutrition and science courses in at once, but it would be worth it. On top of that, the masters would take a year beyond, but at least I would be an RD and could work somewhere part time in the field by that point. I flip-flopped back away from the idea of committing to the program. I had just gotten married and just could not see myself studying Biochem and Organic in the evenings. The program was going to take 2.5 years, including a 6-month, unpaid dietetic internship. My life as a sophisticated corporate account executive would completely change. But a few weeks later work was particularly boring and I decided it was dumb to think I was 24 years old and “too old” for undergrad chemistry classes. It was nutrition! My favorite topic. And I was still excited about the possibility of a career helping others get healthier. The director I met with said that tons of adults go back and get their RD and I wouldn’t be the only married “adult” in Chem 101. She also said many of the students in their program came from liberal arts backgrounds. The fact that there would be others just like me was very comforting. About that time I took a beach trip with my family and they all seemed supportive of the back-to-school idea. So I decided to do it. I was too late for fall semester registration, so I set my goal on January 2008. During the fall of 2007, I took my first nutrition course in the evenings at Queens University. It was essentially nutrition 101, and it was a once-a-week evening course that I went to after work. Among a class of nursing students, I was the only nutrition-degree-seeking student. Life was busy at my PR day job, but I was already on a life-changing high. In December of 2007 I gave 3 weeks’ notice and became a student again. Post: My first chemistry class January 2008. Many people ask me how I was financially able to quit my job and go back to school. Without getting too personal, Matt and I had been saving and I intended to get a part-time job to help pay the bills. And thankfully there were two of us to support each other. We definitely were worried about money, but we had already calculated our base living expenses and knew we could get by so long as I had a supplemental income while I was in school. We were very lucky to not have any student loans from undergrad and we both owned our cars. Our living expenses at the time were very low. And recently, I had started KERF!! Shortly into my first semester back to school I got a BlogHer ad on my sidebar. At first the ad was just a nice bonus, but then KERF grew and so did my income. My blog became a nice part-time job, and considering it was in the nutrition field, I kept at it. A few freelance projects fell into my lap that also helped make ends meet. 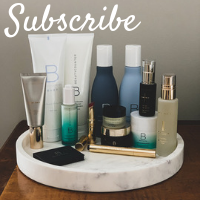 I worked hard on the blog, and it was really nice to have a part-time job that was flexible – my long-term goal! Time went on, I gained readers (little by little – there was never a big breakthrough spike) and my income grew to match. Over the course of my time in school, KERF slowly went from a little hobby to a big job. Post: First day of classes! Classes were overall interesting, challenging and at times, fun. About half of the nutrition program is science (chemistry, physiology, microbiology and the like.) I was able to take some of these at a community college to reduce my commute (and the cost!) 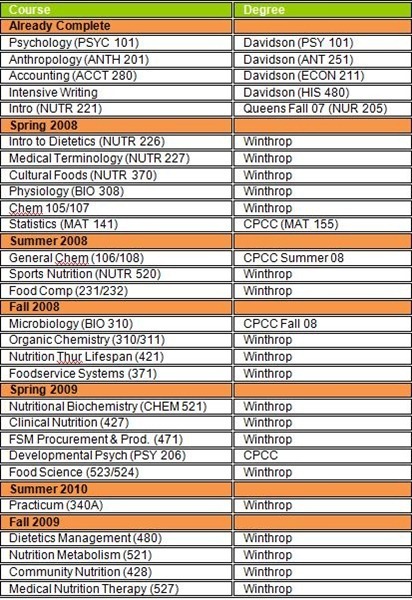 but Winthrop required us to take all of the nutrition courses in their department. I really enjoyed the nutrition courses – topics such as Nutrition Through The Lifespan, Food Science, Sports Nutrition and more – but the chemistry was the biggest waste of time ever. 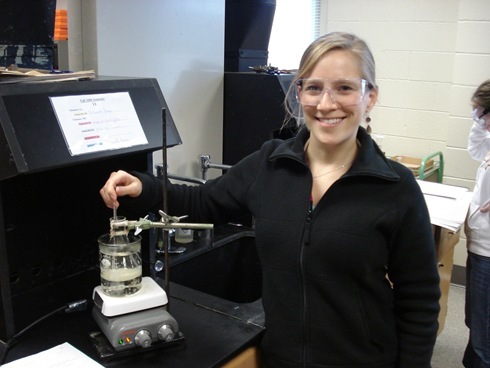 I asked if I could skip the first chemistry class that I had essentially taken in high school, but I was told I couldn’t without passing the final exam – which I knew I couldn’t do since the topics were so specific. So I memorized the periodic table – again­ – and took tests on solids, liquids and gases – again – and wasted a semester with an A. Chem II was even worse!!! It wasn’t until Organic and Biochem that I finally felt like the chemistry courses were providing a nutrition foundation. Having gone through all of the semesters and having taken the RD exam, I can now say that all of that general chemistry stuff had nothing to do with anything else! And let’s not even get me started ranting about the labs. Mixing chemicals for hours and hours and hours taught me nothing about nutrition that I couldn’t have learned in a 10 minute lecture. 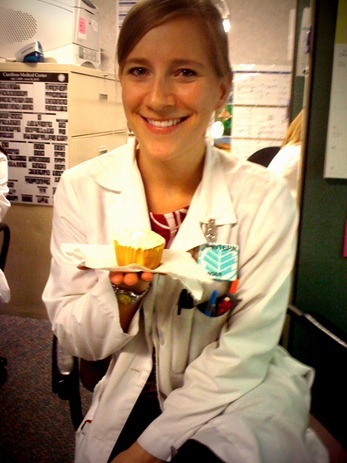 January – July 2010: Dietetic Internship! The hardest class I took over the course of my program was Microbiology, with Organic and Physiology in second and third place. [Micro was my one and only B and the professor was a turkey!!] The Nutrition courses were challenging in my program, but they weren’t impossible. The workload was tough, but the actual information wasn’t difficult to understand. 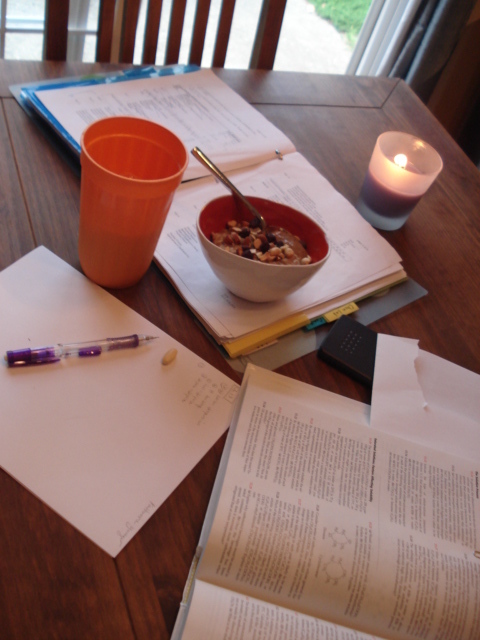 Remember, if you’re going into nutrition, it should be your favorite subject! The science is hard, but you just have to survive. It’s the nutrition courses that matter most. A Micro lab test too – both on Wednesday night. Plus we have a benefit auction on Thursday night! 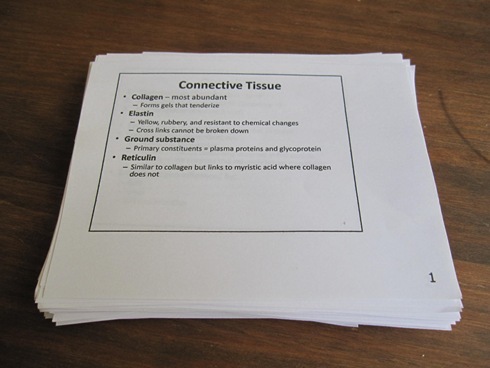 One of my favorite ways to study was to take notes on my computer in Powerpoint (I was lucky to have a handful of professors that allowed laptops) and then print out the slides as flashcards. It was such a time saver! One big surprise I had going into the program: foodservice. Did you know 1/3 of the material is foodservice? Meaning: the temperature of refrigerators, the history of employee management, how to wash dishes, how to prepare and preserve food for the masses. I didn’t know that until the first day of my first foodservice class. To those who are very interested in the clinical side of nutrition, foodservice can be a total drag. And it was! Very pointless at times. Yet, here I am, the owner of a bakery using all of the foodservice knowledge daily. How ironic! But be forewarned: nutrition is not all about vitamins and calories! There’s a lot of other stuff that the ADA makes you learn for the RD exam that is often out of date or so broad of a scope that there really should be multiple kinds of RD. I didn’t mind the foodservice so much because it came so easy to me being well-versed in the kitchen and all. I survived one summer of summer school where I took 3 courses at once that took up my whole day – including a chem lab at night. I was in class from 8am to 9pm Monday – Thursday. It was INTENSE. But I survived. I did homework on Fridays. I played on Saturday and I prepared for the week on Sunday. The courses got harder as I neared the internship, but they also got more practical. My second summer I worked with an RD who owned a private practice in Charlotte. It was a great experience and I really enjoyed it. Since a private practice was my goal going in, I was happy to know I really liked working with clients. And I loved the flexible hours! I enjoyed my time at Winthrop and made some good friends. We had fun bringing potluck lunches and studying together. My courses prepared me well for my internship and even more so for the RD exam. It was convenient and inexpensive to attend (since I got in-state tuition for being a Charlotte resident). Some of the professors were excellent; others not so much. And some of my complaints about the experience were out of Winthrop’s control (like all the general chemistry). I found most of the courses challenging (I got all A’s in my nutrition courses!) and felt I learned a lot. Had it been more intense, I think I would have felt overwhelmed juggling my adult life at the same time. I can’t even imagine having kids and doing this! But people did in my program and they survived. Every semester I seemed to have one killer class (usually a science! ), two medium (the nutritions) and one much easier class. My one big gripe was that I felt at times that the school was a bit out of date. I’m not sure if this is a reflection of Winthrop or the ADA as a whole, but often I felt the blog world and our food trends and the latest research in women’s magazines were 10 steps ahead of the game. I only applied to Winthrop’s internship because I felt I had a pretty good chance at getting in and didn’t feel I needed to spend time or money on other applications unless I did not get accepted to Winthrop. My grades were excellent, and I knew they gave a bit of an edge to Winthrop students. My backup plan was another internship elsewhere a year later if Winthrop’s didn’t work out, but luckily it did! I was very fortunate to bypass the official match because I was admitted as an early admission candidate. (Basically it meant I was in a honors spot 😉 ) That was a big WHEW and I was so thankful to have the weight off my shoulders. I knew going into the internship it was going to be a huge undertaking. KERF had become a full-time job at this point, and I was blogging my heart out 3 times a day – plus doing multiple freelance projects at one time. We were also working on opening the bakery! And selling our house and moving. And I was training for my first half marathon. It was a really busy time. I was able to blog my breakfast very quickly in the mornings, lunch from my iPhone or photographed as I packed it up the night before, and dinner at home. I was miserable inside, but I did my best to not let it affect my outward personality and those around me. I managed to eat well, exercise most days and keep all the balls I was juggling in the air. I enjoyed working in the schools, and the staff in Salisbury was very fun to work with. I enjoyed kids, but I also felt very crushed by the limitations of school foodservice systems. It was an eye-opening experience. I considered this rotation “the dark ages” because I spent two hours everyday commuting to the job in the dark. It was winter, and it was cold and dark all the time except when I was at work! My rotation at the health department turned out better than I had been expecting. I was impressed by all of the projects they were working on – all kinds of community gardens and programs to make healthy eating and exercise more accessible. My time there was short, but I felt the projects I did made a great use of it. The presentation I gave on Real Food is one I still use today! LiveWELL was part of my community rotation and I helped the team there with programs for the employees of Carolinas Medical Center. Our major project was a weight loss support club that did weekly weigh ins, nutrition materials and tracked success. The program was great but I felt a bit out of the loop. The people were great though, and I liked the versatility of the job. I also had the most freedom in this rotation, and I really appreciated that. My final rotation and the most challenging, intense and long was clinical at CMC – Main hospital. It’s Charlotte’s major trauma center and so we saw a huge variety of patients. I enjoyed clinical a lot more than I thought I would. It was definitely my weakest subject going in (and is not Winthrop’s strong point either) so I worried I would be unprepared. I’d say I kept just barely afloat the whole time, although I don’t think I really excelled in this rotation. There was a lot to learn, and knowing in just a few months I would be moving to open a bakery left me a bit unmotivated. I rotated with the other RDs through the floors of the hospital – from cardiac to trauma to the ICUs. 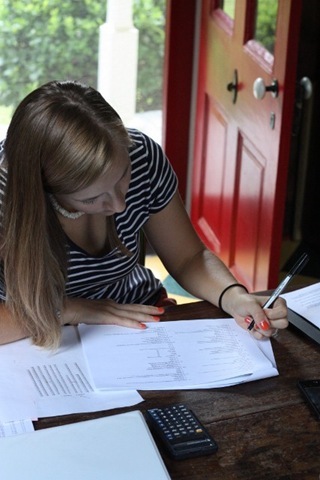 I enjoyed writing notes and the organization that came with clinical, but it also required lots of concentration and focus, which was hard for me. During clinical I also lost my grandmother Younger and had to take an emergency trip to New Jersey, and also squeezed in trips to New York for OpenSky and Charlottesville for the bakery. As a result of the unexpected travel, I had to work several weekends in a row with little rest. There was just too much going on by this point, and I was ready for my internship to be over! And just as fast as it began, it was over. A look back. After I finished my internship, I took a much needed vacation and headed to the beach for a week. 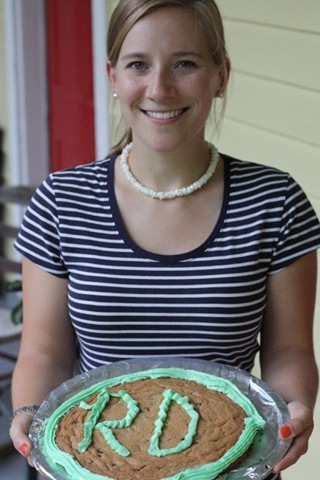 Later that month we moved to Charlottesville, and I couldn’t wait to finally put 100% effort into my blog, my freelance work and the bakery. I did not end up finishing the Masters in Nutrition that I set out to do. Moving to Charlottesville and opening the bakery took priority over staying in Charlotte for another year to get a masters. The classes that I had remaining were all research, stats and a thesis, and I just didn’t think they would add much to my career. Plus I knew I’d be working for myself, and as I like to say, myself does not require a masters degree to hire myself : ) It would have been nice to finish, but, to the disappointment of my mother, I don’t think spending thousands more dollars would have been worth it. To prepare for the RD exam, we took the Jean Inman course during our internship. I came away with a binder of notes. And reading notes is not how I learn material! I’m a flash card girl, and I knew I needed flashcards to sort out what I knew and what I didn’t know. I bought a set of RD In A Flash cards (which look like the site is now down?) from a friend and got to studying. I worked through all 500 or so cards a little bit each week, but I wouldn’t say I studied that hard. I felt I had a really good foundation and just needed to memorize some of those tricky numbers, formulas and rules in each of the topics. As the time got closer to take the test, I picked up my studying a little bit, but I didn’t give it more than a few hours each week. The day before the test…I was at a blog conference! I went to BlogHer and had a few days in Hillsborough before I flew out again to attend the Healthy Living Summit. Since the RD exam wasn’t offered in Charlottesville, I decided to take it at a testing center in Greensboro. I studied all day the day before and then the big day was here. I kept it a secret from KERF just in case I didn’t pass! 2.5 years of work paid off! Most people think RDs have to work in hospitals, nursing homes and other clinical places, but really the field is very broad! That’s what appealed to me most about it years ago, and that’s what I love about it now. When I decided to become an RD a few years ago, I never would have guessed that I would be a professional blogger and writer. While my blog is not focused on the specifics of nutrition, I consider it to be a celebration of healthy food and an example of how to love healthy eating, something that as an RD I’m proud to do. Similarly, I never could have predicted that Matt and I would be bakery owners! 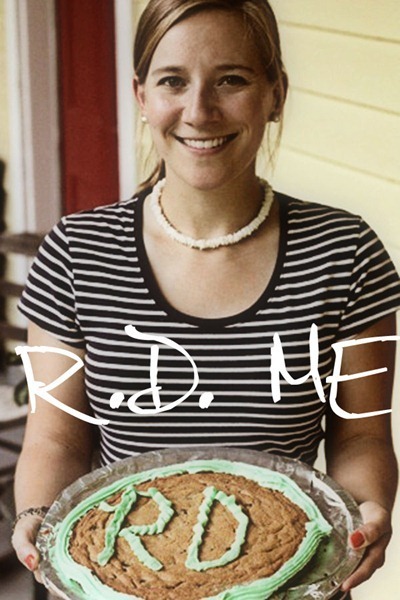 Our bakery’s focus is on whole grains and real food, and as the voice of the Great Harvest Cville, I’m glad to have RD behind my name as I stand behind our products. Since becoming an RD, I’ve had a few people ask me if I feel bad that I “wasted my degree.” Not true!! I’m using it in a very creative ways – from blogging to writing to speaking. Perhaps in the future I will take on clients, seek more local opportunities, or write a book proposal. Had we not opened the bakery, I might have sought out a private practice online like some of my colleagues have done, but KERF and the bakery are taking up so much of my time that I think time is better spent focusing on them. And as my mom says, education is never wasted! Start by researching programs in your area. Email the directors and find out the course plan, cost and admission requirements for each school. Figure out if it’s a possibility. Eatright.org has a nice information page on Becoming an RD as well as search tools to find programs in your area. Learn more about the field by contacting some RDs in your area and seeing if you can shadow them for a day. If you’re already in a program, get any work experience you can in the field. 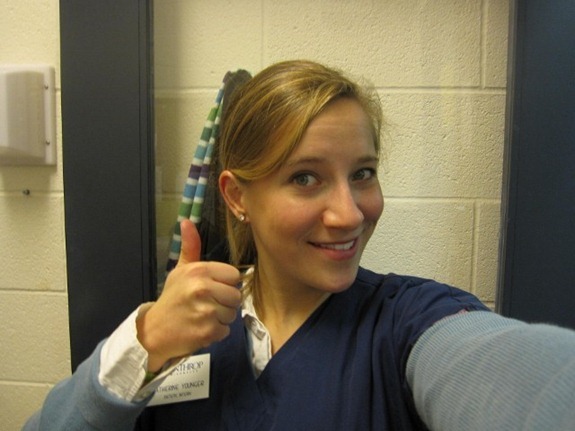 Work in a hospital as a diet tech or see if you can intern at a private practice. It will only help you get ahead and get into an internship. 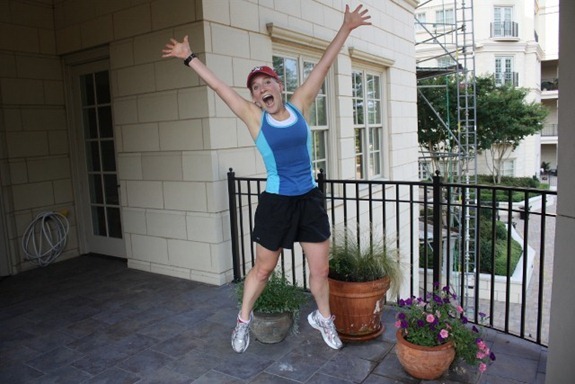 Robyn runs Nutshell Nutrition here in Charlottesville. Consults via email, phone, skype and in person. Heather writes The Diet P.I.